Websoftex is a online web based Producer Company Software Khammam built especially for Producer Company with automatic posting of business data to accounts module. Websoftex is a .NET based centralized database online software for Producer Company Software with core banking operations such Fixed Deposit, Recurring Deposits, Daily Deposit Schemes, Loan to Customers, Monthly Income Schemes, Dividend declarations etc. Websoftex handles the Members details. Websoftex handles all Saving A/c, Current A/c, FD A/c, RD A/c, DDS A/c. Websoftex handles management of Cheque book, Pass book and Bond. Websoftex handles all kind of Loan operations, Printing Loan Ledger, Automatic Interest Calculations. A Producer Company is a legal entity owned and democratically controlled by its members. Members often have a close association with the enterprise as producers or consumers of its products or services, or as its employees. Websoftex has been working in software development since last seven years. In that period we have design lot of websites & software, “Producer Company Software” is one of them. Before developed that our experts research on that in very deep and understood the concept also. 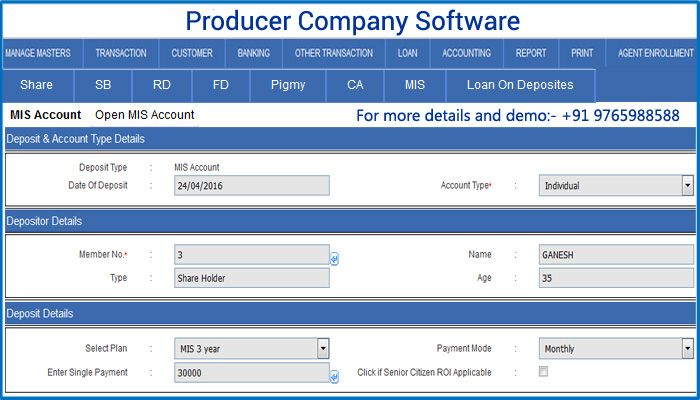 After more research on that we started the work to develop the “Producer Company Software” software. Our team thought that lot of limitation in window base like core banking, real time updation is not available etc, so we decided to develop that application on Web.